Welcome to North Bay Hydro Services, a subsidiary of North Bay Hydro, that provides a wide-range of energy efficient products, services, and support. We boast some truly innovative products at affordable rates, everything from Rinnai tankless gas water heaters that provide instant hot water, to energy efficient outdoor lighting. Rinnai's superior hot water technology delivers greater efficiency and reliability, so everyone benefits with environmental preservation and energy conservation that results in a better planet for us all. Rinnai tankless water heaters reduce energy consumption by up to 40%. They heat more efficiently and only heat water when it is needed, avoiding standby loss. The compact design of a Rinnai tankless water allows flexible installations located closer to fixtures and appliances. This reduces the wasted water while "waiting" for the heated water to arrive. Rinnai is an environmentally sound gas appliance that meets the strict agency requirements of The South Coast Air Quality Management District. Each Rinnai tankless water heater produces very low nitrogen oxide and carbon dioxide emissions, contributing to cleaner air and a healthier home. The service life of a Rinnai tankless water heaters lasts up to 20 years. That is 2-3 times longer than traditional tank water heaters. They are also significantly smaller in size, using less materials and reducing what may end up in landfills. 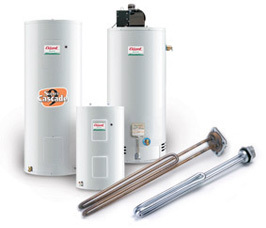 The primary components of Rinnai tankless water heaters are the copper heat exchanger and stainless steel burners. These are recyclable, further reducing their end-of-life waste. To learn More, visit the Rinnai website. Available in 40, 50 and 60 gallon tanks, in conventional model or with direct vent options. Available in 40, 60 and 100 gallon tanks.